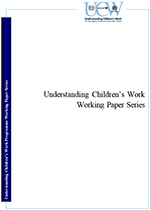 Abstract : Cash transfer programs are widely used in settings where child labour is prevalent. Even if many of these programs are explicitly implemented to improve children’s welfare, in theory their impact on child labour is undetermined. This paper systematically reviews the empirical evidence on the impact of cash transfers, conditional and unconditional, on child labour. We find no evidence that cash transfer interventions increase child labour in practice. On the contrary, there is broad evidence that cash transfers, conditional and unconditional, lower both the extensive and intensive margin of child labour. Our findings underline the usefulness of cash transfers as a relatively safe policy instrument to improve child welfare, but also point to knowledge gaps that would need to be addressed in future evaluations to provide detailed policy advice.